According to the Indonesian folklore, historians account that this blade was designed after a tiger’s claw and this is why the blade’s latest versions still have a curved shape. This unique blade can be used to grapple, rip or tear, and make cuts. Originally, the karambit was a farmer’s tool back in the 11th century Indonesia. However now, it comes as both a fixed blade and a folding pocket knife that people buy mostly because of its different and awesome design. Just look at the cool karambit knives for sale available everywhere and tell us honestly, won’t you like to have one for your blade collection? We say that your answer is “Yes!”, isn’t it? Every person, living in the US, who wants to get his or her hands on different types of cool pocket knives comes flocking to Knife Import and buy them on wholesale rates. Yet, no other blade is as popular as the folding karambit knife. Why is it so popular? Well, hold on just a moment, we are publishing this blog to tell you about all the awesome features anyway. So, keep on reading and you will find out various interesting facts about this curved knife. Given the karambit’s blade curved design, today’s latest versions always include a safety ring. This helps you insert your thumb or one of your finger in the blade’s handle to maneuver it around and use it effectively. You might have noticed Hollywood films showcasing the use of the karambit knife as a tactical weapon in fighting sequences. Actors and stuntmen make use of its ergonomic handle to do various cool tricks that make everyone want to get fixed blade or pocket knives for themselves. We don’t mean to say that you want to go outside and start a fight in the street right now with a random stranger, just to test your knife. But what we mean is this that the design of this blade makes it an optimal option for fights, may that only be an attempt at self defense. The ring allows the wielder of a karambit to attack at any moment, no matter, if his or her hand is closed, open, in motion or just resting. Don’t you think this reason should be cool enough to have this blade on your person? No? You want more? Okay! No one really wants to be in a situation where they have to defend their lives through fighting. So, why you need a karambit pocket knife still? Because it’s a great everyday carry (edc) knife that can be used to do— well “everything”. Anything that a normal blade can do, you can do it with this curved knife as well. As long as any blade is sharp it can be used in the similar way. You can cut electrical wires, tape off packed boxes, or even pieces of meat on your dinner table. Basically, you can do anything with it that entails cutting, slashing, ripping and the sorts. Climb Walls Using a Karambit Knife? At least, in games you can, as the most unique thing about this blade is that you can use it to climb walls in various video games. Now, that must have reminded you of all the cool ninja weapons out there as well. But, this seems a viable use of this blade due to its curved design. Therefore, if you ever need to scale up a wall in order to reach somewhere, or escape someone chasing after you, a karambit knife might just be a great resource. Though, we have yet to see someone accomplish it on video! These knives are inexpensive when compared with other US brands’ items in this category. While prices of their products are always more than fair considering their amazing designs and stylish blades. If you want the best karambit knife that can stand the test of time, then you should definitely go for this brand’s fixed blade and folding tactical knives. The MTech USA brand is rather well known for its cool pocket knives. However, that’s not all this brand about as you will find both spring assisted and fixed blade knives in its huge catalog. While comparing Tac Force knives with MTech, we will know that the latter is inexpensive. However, it doesn’t mean they lack in quality. The MTech knives have great designs and quality along with which the brand has focused on keeping its product as affordable as possible. 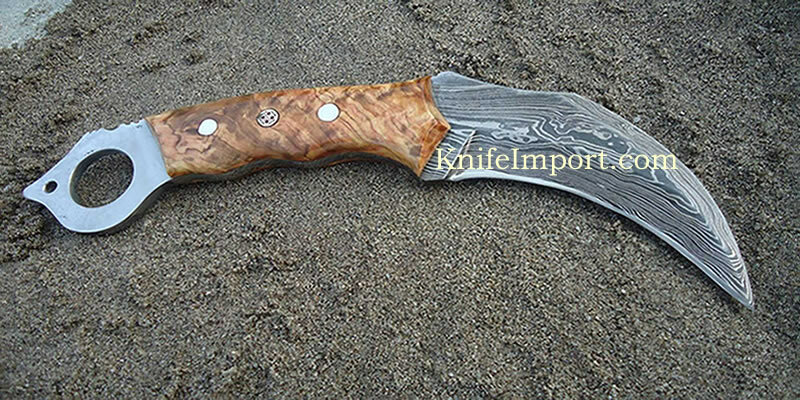 If you take some time out and look for more details, then it will not be long before you have a karambit folding knife or perhaps a number of them. Who are we to stop you from expanding your collection of blades. Just remember, if you are thinking about getting a pocket knife as a self defense weapon then every blade comes with their specific tactics in such scenarios. So, it’s better to get some training with these curved pocket knives. Otherwise, you will not be able to use a karambit to its full potential. Even though it is designed for precision, efficiency and safety— all blades are only as good as its wielder’s skills of handling a sharp object. Lastly, we hope our informative blogs will keep quenching your thirst of knowledge regarding cool knives and swords, because we want to be by your side in all types of adventures you take on in life.